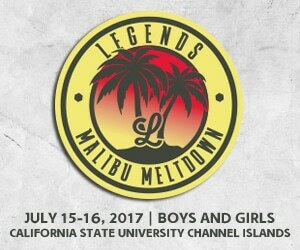 Legends Lacrosse has announced the Malibu Meltdown has been scheduled for July 15-16 at CSU Channel Islands. The Malibu Meltdown is a co-ed event looking to service local and regional level teams ages U11-Elite for boys and U15-Elite for Girls. The Malibu Meltdown is designed to be a fun filled experience on and off the field in one of the most premier areas on all of the US and will serve as a great way to enhance your player’s summer season. Strategic scheduling and partnerships with local Visitors Bureau’s will allow Legends to deliver on a family focused event in a vacation destination. Host Cal State Channel Islands provides for a short trip to entertainment and activities no matter what your liking is. Journey down to the sand and dip your toes into the pacific ocean at some of the top rated beaches in the world or head towards the mountains of Los Angeles and enjoy time in nature hiking and taking in some iconic views. Add in plenty of local eating and drinking options and 4 airports in the area and it all comes together to make the Malibu Meltdown a tournament you don’t want to miss.